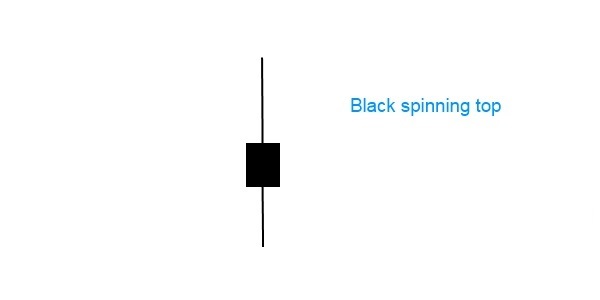 Black spinning top is a single candlestick pattern with low reliability. Occasionally it behaves like a continuation pattern, other times it signals a trend reversal. This pattern has a small black body and long lower and upper shadows. The market moves higher and then sharply lower. The opening and closing price are very close to each other, this creates the tiny black body. There is a complete indecision between the bulls and the bears. The actual length of the shadows is not important. If a spinning top is part of another pattern, it has more importance. It is a turning point in morning star and evening star formation. When it is engulfed by the previous candle’s real body, it is part of a harami.